Malaysia’s Prime Minister Mahathir Mohamad is in Beijing on his first trip to China, since winning May’s election. Al Jazeera’s Florence Looi reports from Kuala Lumpur, Malaysia. Mahathir is a smart man and no fool. He had dealt with the corrupt chinese communists in the past, the current thugs wont be any different. Mahathir will cancelled the projects as these projects are debt trap, doesn’t benefit Malaysia, and does not use local technology, resources or labors. Emperor Pooh Xi will not last, he’s over played has hands and OBOR will not end will for china. China is a treacherous invader and the root of all evils in Asia. 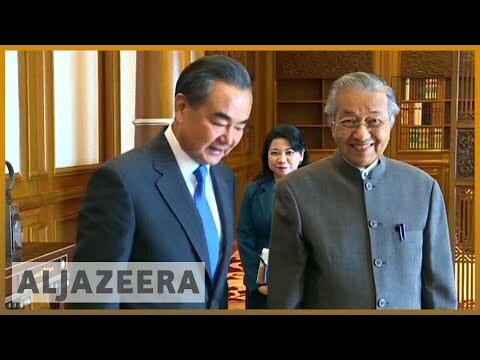 Dr. Mahathir returned just in time to keep China at bay and save Malaysia from becoming slave of those parasite scums. another waste of time and money official foreign trip by government leader. Wow. Such respect for China to behave peacefully and democratically. If a certain other power had that happen to them then I’m sure “freedom and democracy” would be coming to Malaysia in the form of 1000000 dead Malaysians.